The British Alpaca Society (BAS) represents Alpacas and their owners, and aims to protect the welfare of the animals. They also provide education and support to the owners of these animals. In addition to these services, BAS hold events where breeders can bring their Alpacas to the show. Here, they can compete with other farmers and their herds. 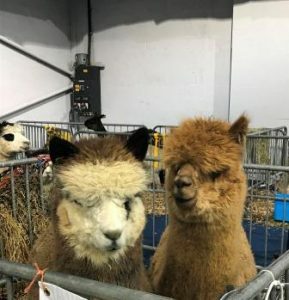 At the National Show in Telford, there were competitions for the fleeces and halter classes. All of the winners were decided by a judging panel. For more information about the British Alpaca Society and their events, click here to go to their website. The main show and exhibition for this event took place in halls 2 and 3 at our venue. Animal pens were set up in both of the halls. Our electricians installed almost 100 sockets for all of the pens to power fans to keep the Alpaca’s cool. Other electric supplies were installed to power lighting and other AV equipment being used. For the competitions which were part of the show, tiered seating banks were set out by our StagecraftUK team. Other furniture that was required, such as trestle tables, chairs, and parrot stands, were also provided by us. Additionally, multiple runs of truss were rigged from the ceiling above the area where the competition was taking place. A screen was hung from one of these rigs, whilst lighting was attached to the others. The lighting was used to light up the ring where the Alpacas were competing.